This Lexington winter has been pretty fair in terms of the weather and temperatures. With six weeks of winter left, according to Punxsutawny Phil, that could all change. 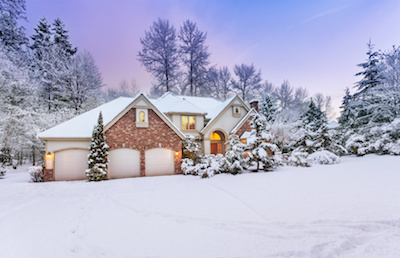 Many Lexington residents don’t know that winter snow and ice could be damaging to their HVAC systems – after all, the furnace is inside and the air conditioner isn’t in use! Below, you’ll find how winter weather can affect your heating and cooling systems, and what you can do to prevent damage. Carbon monoxide is regularly produced by the combustion process a furnace uses to create heat. Normally, it vents safely through exhaust pipes outside your home. Accumulating snow and ice can block the exhaust pipe, causing deadly carbon monoxide to build up in your home. Every home should be equipped with carbon monoxide detectors on every floor. During periods of heavy snow and ice, check around the exhaust penetration in your roof to see that it’s clear. If the pipe blocked and you must climb onto the roof, use safety gear to prevent falls. Your air conditioner may not be on, but it is sitting outdoors, subjected to the elements. It may be positioned right under a rain gutter, where damage can occur from falling ice. As icicles form and grow, they become quite heavy and eventually break off due to the weight – and come crashing down on your air conditioner, damaging the cabinet and sensitive equipment inside. Throughout the winter, regularly check the guttering above your air conditioner, and clear away small icicles as they form. If we see a heavy snowfall and experience sudden warming after, we could see lots of water runoff due to melting. This water can form standing puddles around exterior components, and even back up into the home, flooding areas where furnaces are stored. Contact with water can cause rust and corrosion to components, creating severe damage. If water backs up into your systems, a sudden drop in temperatures can cause refreezing and expansion, creating further damage. Always clear your air conditioner of large snow accumulation, and monitor your home for flooding during a heavy snow melt. If you discover damage to your heating and cooling systems, caused by snow and ice, Climate Control is available to assist you. Our NATE-certified HVAC technicians will pinpoint system problems and provide quality repairs, or guide you through the replacement process if necessary, helping you select the right equipment for your home.